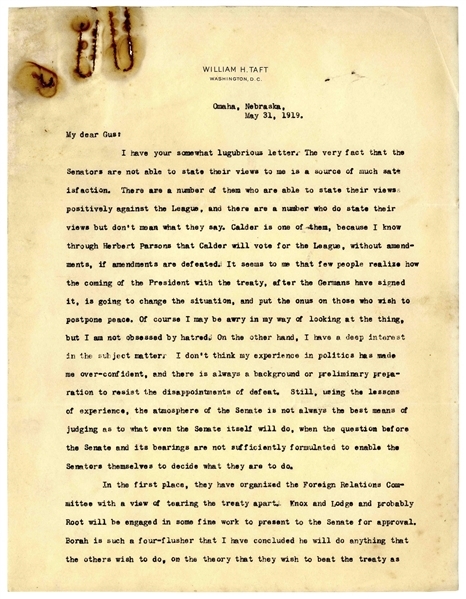 Exceptional, detailed letter signed by William Howard Taft regarding the League of Nations, written while President Woodrow Wilson was negotiating the Paris Peace Conference in Europe. 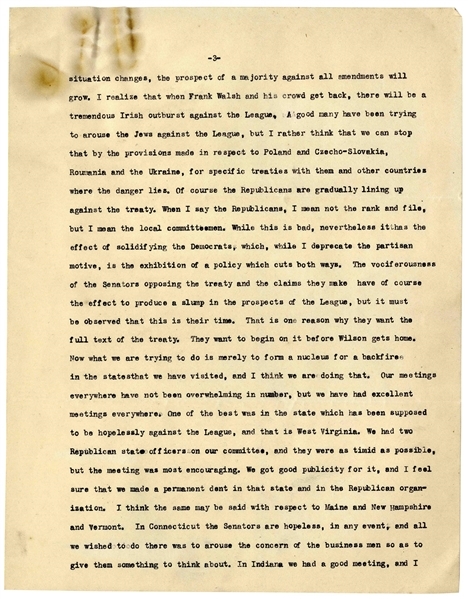 Datelined 31 May 1919 from Omaha, Nebraska, Taft writes to his friend, journalist Gus Karger regarding the likelihood of Senate approval of American membership in the League, with colorful analysis of the Senators and constituencies involved, such as the Jewish community; Taft, in fact, goes into detail regarding how to gain Jewish support of the League, by forming treaties with countries ''where the danger lies''. 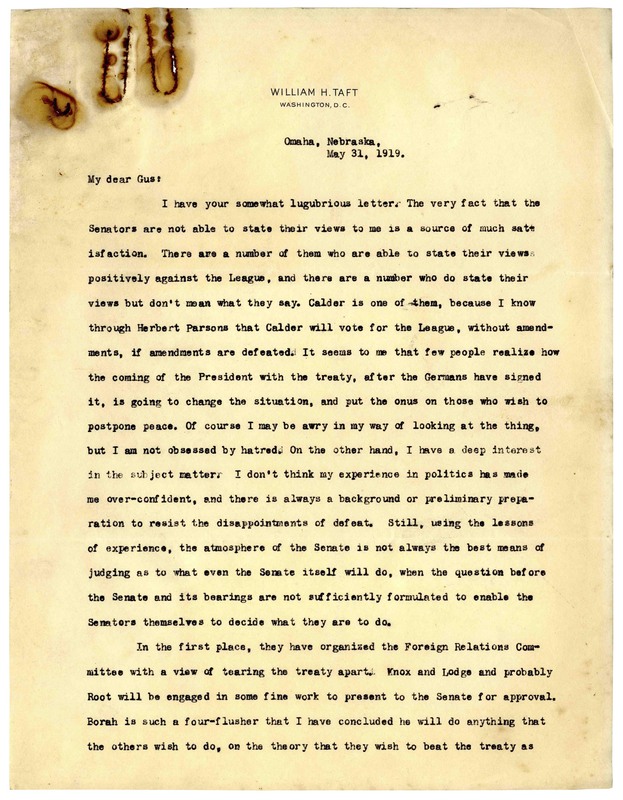 As a Republican who supported the League of Nations, Taft was at odds with his party, who generally opposed it. 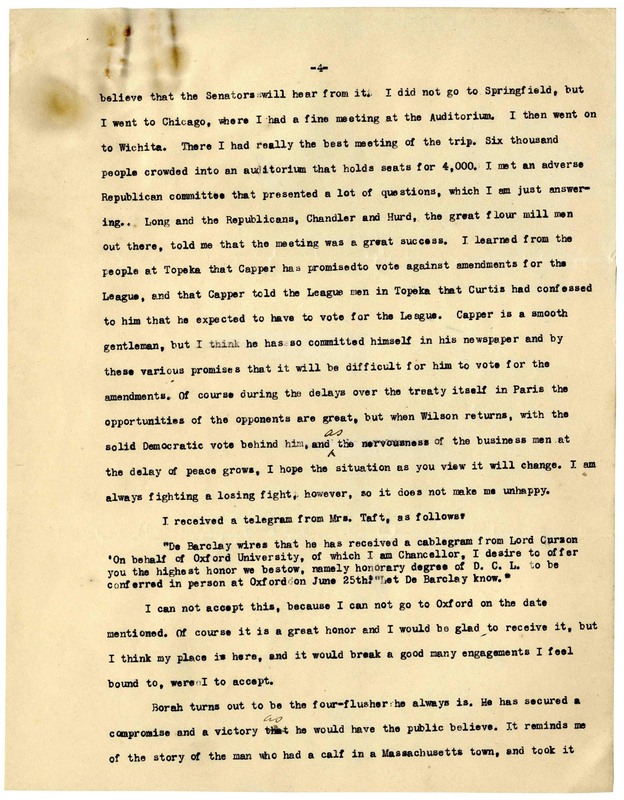 Taft then discusses the support for the League in meetings and speeches he's given around the country. 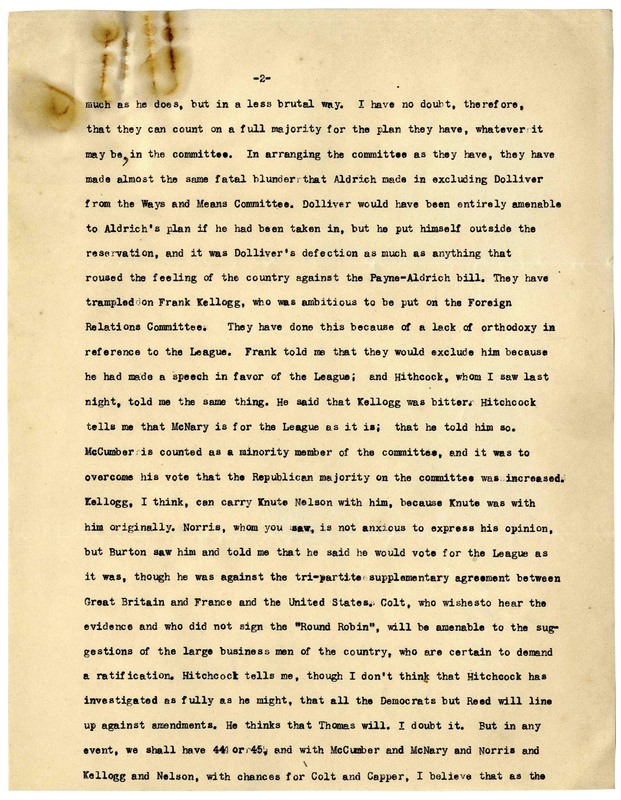 He continues, ''...Of course during the delays over the treaty itself in Paris the opportunities of the opponents are great, but when Wilson returns, with the solid Democratic vote behind him, and as the nervousness of the business men at the delay of peace grows, I hope the situation as you view it will change. 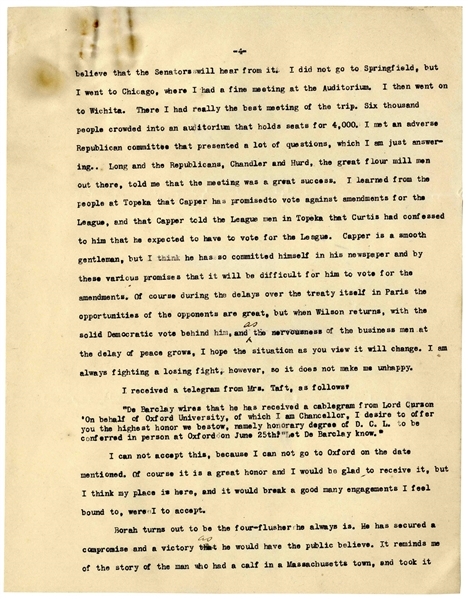 I am always fighting a losing fight, however, so it does not make me unhappy...'' Taft winds up the letter by telling Karger that Oxford has extended an honorary degree to him, which Taft will be unable to accept, and then tells a funny story as an analogy to the ''four-flusher'' Senator he mentions earlier in the letter. 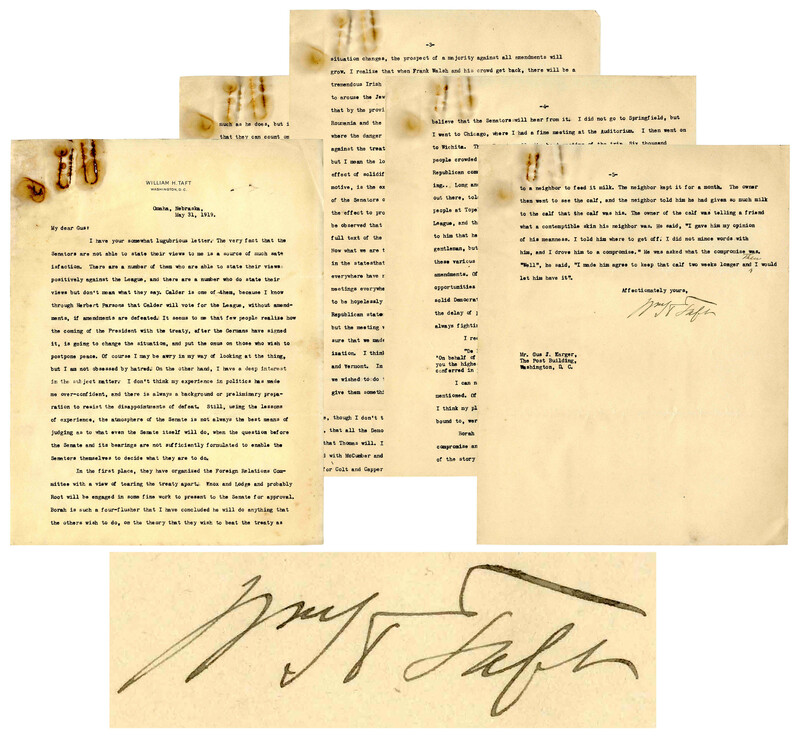 Signed at the conclusion, ''Wm H Taft''. 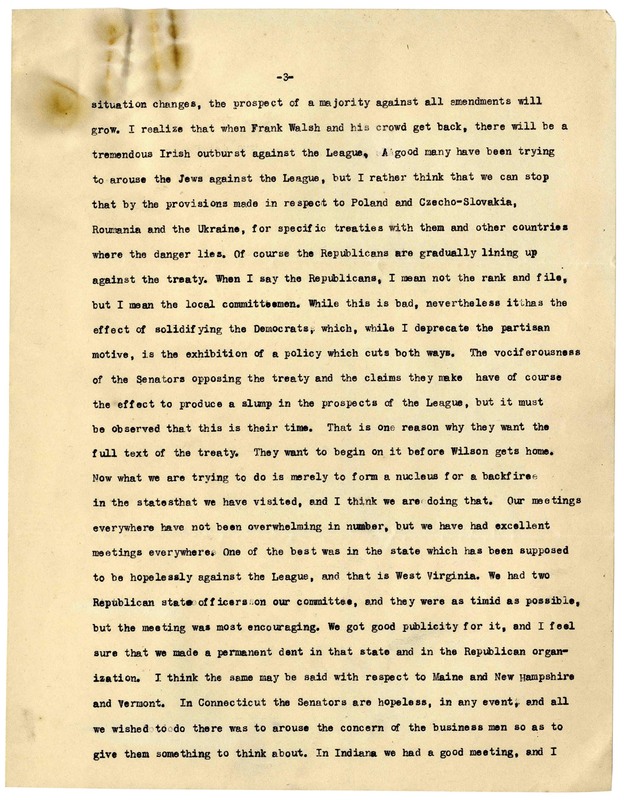 In the end, it turned out that Karger's prognostication regarding the League was correct, rather than Taft's, as the Senate failed to muster the 2/3 votes needed to ratify. 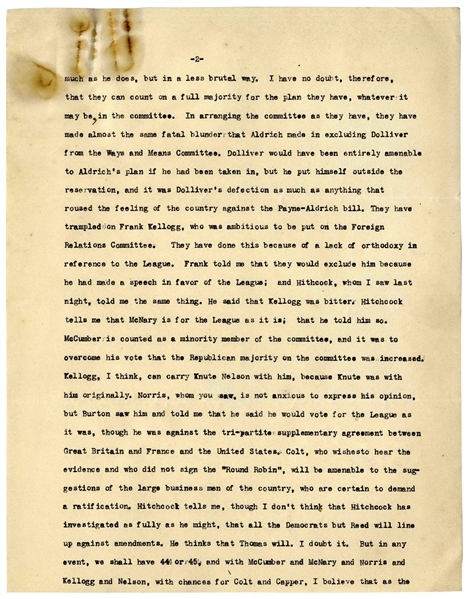 Letter spans five pages on five separate sheets, each measuring 8'' x 10.5''. The first page is on Taft's embossed stationery, and Taft makes several hand-corrections to the text throughout. Rust stains from paperclip impression, otherwise near fine condition.